As I mentioned earlier this month, I will be posting some things about a fantasy rail system that I started working on for the Tampa area during the course of 2010. At the time that I began working on this fantasy system, Hillsborough Area Regional Transit was promoting a one cent sales tax increase for Hillsborough County to help fund road construction and transit improvements. The plan was very ambitious and included several light rail and bus rapid transit lines. However, the plan left many questions to be answered, thus confusing a lot of voters. On top of that, the economy was still in a very bad state and many anti-tax conservatives were lumping the sales tax hike with President Obama’s high speed rail plan. All of the massive confusion led to a massive defeat of the sales tax. After the defeat of the sales tax referendum, Governor Rick Scott pulled the plug on Florida’s high speed rail plan. With much of Tampa’s transit ambitions dashed, I halted all work on my fantasy rail system until a later time. 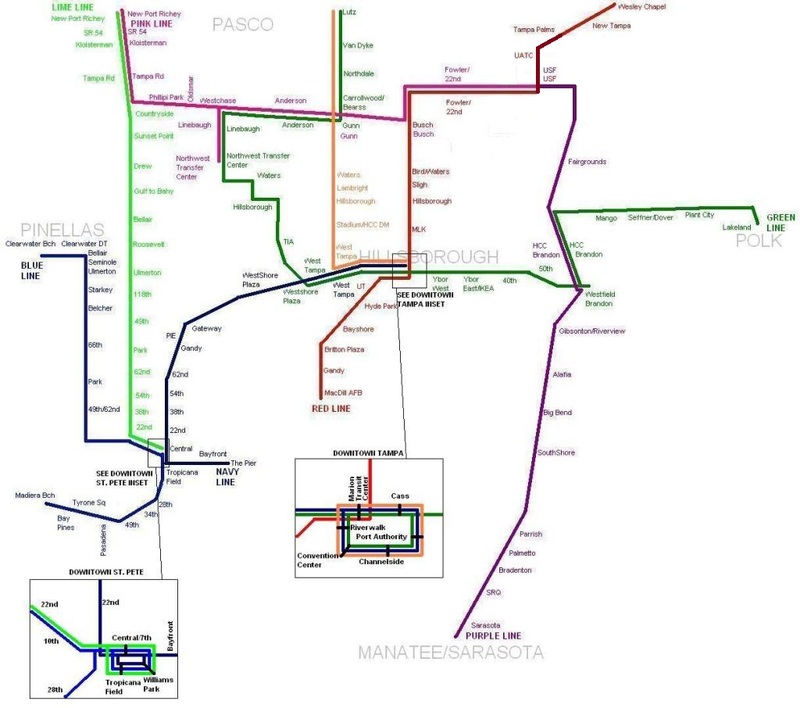 Fast forward to 2013: Pinellas County is gearing up for their own transit expansion plan and the chatter about rail has restarted, being led this time by the grassroots efforts of Connect Tampa Bay. Therefore, I have decided to go ahead and restart my fantasy rail system project for the Tampa area. To read more about this project, click “Continue Reading”. Before showcasing the new items that I have in regards to the project, I first wanted to share what I had originally made. The first map is a combination of light rail and commuter rail lines for Hillsborough and Pinellas counties. Some of the commuter rail lines cross into Pasco, Hernando, Polk, and Manatee counties. My original light rail and commuter rail fantasy map for the Tampa area. Looking back on this map, I realize that the placement of some of the stations do not make sense. For that reason, I will be making a new fantasy system map that is much more clear than the one above. By the way, the original map was done using good old Microsoft Paint. In my next post, I will be going over Line 3 of my fantasy subway for Norfolk, VA, and then the Red Line for my fantasy rail system for Tampa. Also, be sure to vote on my recently posted poll question. ← Will we ever see any type of rail in the interstate medians? Yes they did Keith, and I’m looking forward to what improvements will be enacted in the coming years. I’ll have some updated fictional system projects put together in early 2019.